Free up drawer, cabinet, or shelf space easily with the EZOWare Mountable Wrap Organizer! 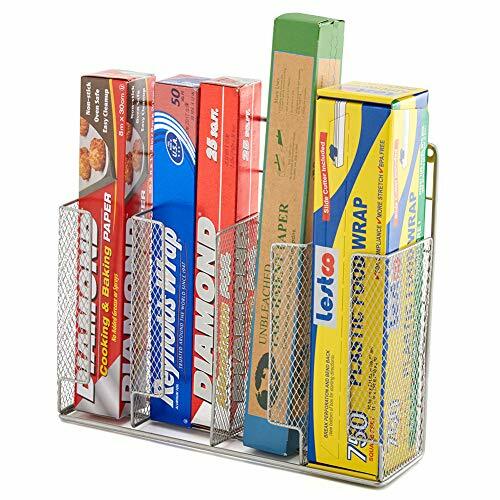 The organizer can easily be installed to walls or inside of cabinets with 4 slots to hold your rolls of aluminum foil, wax papers, plastic wrap, sandwich storage bags or other kitchen and household items. Constructed of powder coated rust-resistant metal mesh and wire for a long-lasting and durable storage solution. The EZOWare Mountable Wrap Organizer offers a convenient way to keep aluminum foils, wax papers, plastic wraps, and food storage baggies out of sight yet easily accessible. EASY ACCESS – It can be installed onto cabinet doors, walls, or pantry spaces for quick and easy storage and access to wraps and more. Open top mesh slot design to easily insert and remove rolls and other items. MULTI-PURPOSE – A great way to organize cooking, baking, or food storage wraps or use it to store kitchen and household essentials. The slots offer space to food cans, bottles, cleaning supplies, and much more. EVERYDAY CONVENIENCE – Constructed of wire with a powder coated and rust-resistant finish. Durable materials for long-lasting everyday use. SPECIFICS – Dimensions: 13.4 (L) x 3.5 (D) x 11.4 (H) inches (34 x 9 x 29cm). Material: Metal. Package Includes: 1x Organizer, 2 Mounting Screws, & 2x Wall Anchors.